Multi-Conveyor employs a full staff of designers, mechanical engineers and project managers to assist your company with not only better ideas but proven solutions. As Multi-Conveyor grows, we find our market companies trimming their own engineering staffs and relying heavily on the talents of our strong personnel to concept and design their equipment and devices. Rapid growth necessitated the expansion of our skilled conveyor design team allowing Multi-Conveyor to choose talented professionals with extensive knowledge in our industry. Our designers create both custom and standard solutions including modular, tool-less and CIP (clean-in-place). 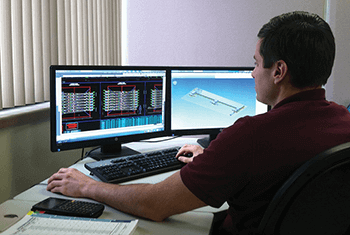 Using OEE (Overall Equipment Efficiency) as our philosophy, our designers put new ideas in motion daily. Each week we strive to improve department efficiencies; each month we plan to add equipment to build a better product. And, each year we ask ourselves . . . can we make an even better conveyor to move, twist, turn or help package your product. The answer is "YES".